Meteorological data are transported online from the observatory Blue Eye 600 placed in AsÚ in Ondřejov. Warning: the pages are continuously updated every 1 minute. Many years of experience in automation and robotization of astronomical devices resulted into the project “Development of the technologies for fast robotic observatories and laser communicating systems” based on the company's know-how. The project itself has been realized in cooperation with the Astronomical Institute UK Prague supported by Technology Agency of the Czech Republic (TA ČR). Within only 18 months a fully robotized observatory, which was called “Blue Eye”, was designed, built and installed. 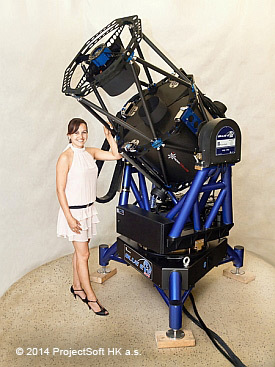 On ultraspeed Alt/Az installation (speed of moving is up to 90°/sec) a RC optical system telescope with diameter of the mirror of 0.6m is installed. 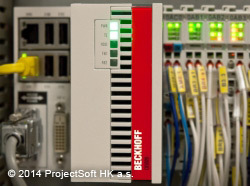 The installation which is exclusively based on industrial components including PLC Beckhoff is equipped with most modern direct-drive control. A special dome is designed so that it enables fast opening and doesn't prevent the telescope from fast moving. All modern industrial electronics is installed in a special container and a number of meteorological sensors independently care about ultimate safety of the whole observatory. Observing can be performed in several modes such as local, remote or fully robotized ones with usage of the planning software which enables the astronomer nice calm sleep in his bed while the telescope works absolutely independently. The communication interface for customer own solutions with the protocol ASCOL is a part of the basic version. The aim of this project is universality, full automation, speed of slewing and mobility. Everything is easy to be disassembled, moved and assembled again without necessity to cast concrete pillars. That all considerably decreases installation costs. With the kind permission of the Astronomical Institute AV ČR, v.v.i., the Blue Eye observatory is placed for testing in the premises of the observatory in Ondřejov. The complete equipment can serve not only for astronomy but also for example for watching gamma flashes, for laser terminals or telemeters, for searching cosmic dust/satellites and so on. We expect more other ways of usage by future customers. A turnkey delivery of the observatory includes complete installation.